There are elephants in Asia and more in Africa. African elephants are in trouble. Each year, tens of thousands of the enormous beasts are killed for their tusks, and conservationists fear they are on the road to extinction. Across Africa, poaching is on the rise. Progress is being made here and there, but the battle to save the largest animals on the Earth is far from being won. Across the continent, elephant poaching is happening on an industrial scale. According to the shocking results of one study, the population of savannah elephants declined by 30% between 2007 and 2014. 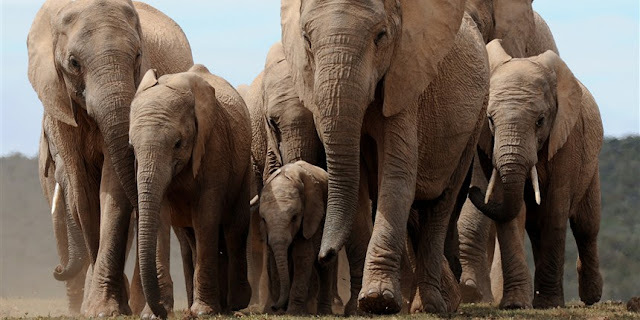 There are roughly 400,000 savannah elephants left and that number is falling by 8% per year. One novel attempt in saving them is - aerial drones, which first proved their value decades ago on military battlefields, are proving to be a key player in the ongoing battle against poachers. For the past four years, anti-poaching "Bathawk" drones have been flying over national parks and game reserves in South Africa, Malawi, and Zimbabwe. Then they are tried in Botswana as part of an anti-poaching campaign too. The drones can stay aloft for two-and-a-half hours while relaying live video from their onboard cameras to ground-based crews up to 15 miles away. The crews then share surveillance information and videos with park rangers and local police. For us, Sriman Narayana is the only savior ~ for human beings to get salvation and by His divine grace, He showers benevolence on every living thing as evidenced by this act of kindness on might elephant Gajendra. Triplicane is abuzz with the festivities of Float [theppam] and today 21st Feb 2018, marked the concluding of the annual float festival. Today it was Sri Varadha Rajar. In the sacred divyadesam of Thiruvallikkeni, moolavar of Varadharajar is on “Garuda vahanam” which is very unique. Sure you know the puranic legend of ‘Gajendra moksham [salvation of elephant Gajendra]’ ~ when Lord Sriman Narayana Himself came down to earth to protect Gajendra(elephant) from the death clutches of Makara (Crocodile). Gajendra the King of elephants, was attacked and caught by a crocodile and death seemed imminent. Gajendra had been rendering service to the Lord by offering Lotus and when he appealed to God to protect him, Maha Vishnu appeared on Garuda vahanam and saved the elephant by killing the crocodile with his ‘Chakram’. It also explains that one who falls under the divine feet of Lord seeking salvation will surely be taken care of. The reenactment of Gajendra moksha takes place during the full moon in the month of Aadi. The Sarrupadi [alankaram] for Lord Varadhar for theppam was ‘Gajendra moksha thirukolam’. Lord Varadhar appearing in the form whence he saved the devoted elephant from the savage attack of the mugger crocodile. It was the posture of Lord having released his chakra to save the elephant; One of the arms in prayoga posture, having released the chakra – holding the azhi [the sangu / conch] in the other, holding Gatha in one and abhaya hastham on the fourth thirukaram. It was indeed a great darshan of the Lord. Appropriate to recall the Thirumozhi pasuram of Thirumangai Mannan on Lord Varadharajar. Here are some photos depicting the Theppam, Thirukolam and one taken during the hastham purappadu earlier to make you experience the thirukolam better.